During the production of crude palm oil, large amount of waste and by-products are generated. The solid waste streams consist of empty fruit bunch (EFB), mesocarp fruit fibers (MF) and palm kernel shells (PKS). Reuse of these waste streams in applications for heat, steam, compost and to lesser extent power generation are practised widely across Southeast Asia. POME or Palm Oil Mill Effluent is an underutilized liquid waste stream from palm oil mills which is generated during the palm oil extraction/decanting process and often seen as a serious environmental issue but it is a very good source for biomethane production. Therefore, discharge of POME is subject to increasingly stringent regulations in many palm oil-producing nations. POME is an attractive feedstock for biomethane production and is abundantly available in all palm oil mills. Hence, it ensures continuous supply of substrates at no or low cost for biogas production, positioning it as a great potential source for biomethane production. (Chin May Ji, 2013). POME is a colloidal suspension containing 95-96% water, 0.6-0.7% oil and 4-5% total solids, which include 2-4% suspended solids. Biological Oxygen Demand (BOD) generally ranges between 25,000 and 65,714 mg/L, Chemical Oxygen Demand (COD) ranges between 44,300 and 102,696 mg/L. Most palm oil mills and refineries have their own treatment systems for POME, which is easily amenable to biodegradation due to its high organic content. The treatment system usually consists of anaerobic and aerobic ponds. (Sulaiman, 2013). 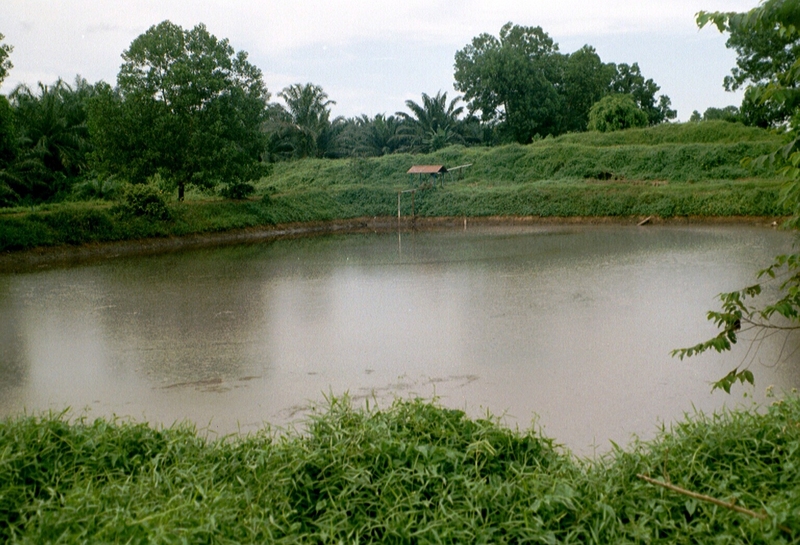 Open pond systems are still commonly applied. Although relatively cheap to install, these system often fail to meet discharge requirements (due to lack of operational control, long retention time, silting and short circuiting issues). Moreover, the biogas produced during the anaerobic decomposition of POME in open pond systems is not recovered for utilization. The produced gas dissipates into the atmosphere where it causes adverse environment effects (due to the fact that CH4 is a twenty times stronger greenhouse gas then CO2 (Chin May Ji, 2013). Biogas capture from POME can be carried out using a number of various technologies ranging in cost and complexity. The closed-tank anaerobic digester system with continuous stirred-tank reactor (CSTR), the methane fermentation system employing special microorganisms and the reversible flow anaerobic baffled reactor (RABR) system are among the technologies offered by technology providers. (Malaysian Palm Oil Board, 2015). Biogas production largely depends on the method deployed for biomass conversion and capture of the biogas, and can, therefore, approximately range from 5.8 to 12.75 kg of CH4 per cubic meter of POME. Application of enclosed anaerobic digestion will significantly increase the quality of the effluent/ discharge stream as well as the biogas composition, as mentioned in table below. A closed anaerobic system is capable of producing and collecting consistently high quality of methane rich biogas from POME. Typical raw biogas composition will be: 50-60 % CH4, 40-50 % CO2, saturated with water and with trace amounts of contaminants (H2S, NH3, volatiles, etc.). The amount of biomethane (defined as methane produced from biomass, with properties close to natural gas) that can be potentially produced from POME (within the Southeast Asian region) exceeds 2.25 billion cubic meter of biomethane (on a yearly basis). Especially Indonesia and Malaysia, as key producers within the palm oil industry, could generate significant quantities of biomethane. An impression of the biomethane potential of these countries including other feedstock sources is being highlighted below (VIV Asia, 2015). 25 billion m3 of biomethane from Palm Oil Mill Effluent (POME). 2 billion m3 of bio-methane from Sewage Treatment Plant (STP). 9 billion m3 of bio-methane from Municipal Solid Waste (MSW). 1 billion m3 of biomethane from Palm Oil Mill Effluent (POME). 2 billion m3 of biomethane from Sewage Treatment Plant (STP). 8 billion m3 of biomethane from Municipal Solid Waste (MSW). The Asian Pacific Biogas Alliance estimates that the potential of conversion of biomass to biomethane is sufficient to replace 25 percent of the natural gas demand by renewable biogas (Asian Pacific Biogas Alliance, 2015). To sum up, due to the high fraction of organic materials, POME has a large energetic potential. By unlocking the energetic potential of these streams through conversion/ digesting and capture of biomethane, plant owners have the opportunity to combine waste management with a profitable business model. Alawi Sulaiman, Z. B. (2007). Biomethane production from pal oil mill effluent (POME) in a semi-commercial closed anaerobic digester. Seminar on Sustainable Palm Biomass initiatives. Japan Society on Promotion of Science (JSPS). Asian Pacific Biogas Alliance. (2015). Biogas Opportunities in South East Asia. Asian Pacific Biogas Alliance/ICESN. Chin May Ji, P. P. (2013). Biogas from palm oil mill effluent (POME): Opportunities and challenges from Malysia’s perspective. Renewable and Sustainable Energy Reviews , 717-726. Sulaiman, N. A. (2013). The Oil Palm Wastes in Malaysia. In M. D. Matovic, “Biomass Now – Sustainable Growth and Use”. InTech.